Fashion Sewing Cabinets 8300 or 8300Q Quilters Cloud 9 Table, Manual or Electric Lift, 3 Position Stop, 4 Drawers, Round Edges, Machine Opening 27x14"
AvailabilityThis item ships separately from other warehouses. Usually leaves the warehouse in 6-8 weeks. Please specify brand and model number freearm sewing machine. At the request of a number of customers we have modernized the look of our Cloud 9 and 7th Heaven cabinets. The doors and drawers will no longer be routed with the 'tombstone' pattern or 'waterfall' edges. 8300 Quilter's Cloud 9 NEW! Premium 4 Drawer Cabinet in White, Opening 27" x 14", Only cabinet with no square corners, Curves Keep Quilts from Catching on edges. Is quilting with your sewing machine a drag? Not with this cabinet! There are no square corners to catch on your garment or quilt while sewing. Fabric flows over the table top curves. Shown with Optional embroidery module holder on left side are available for Bernina and Janome among other brands of embroidery machine. The exciting new 8300 sewing cabinet is a big hit! The large desk top with round curves and rounded edges allows fabrics to flow easily as you work. Most of the cabinet working surface is left of the needle where your quilt would lay. 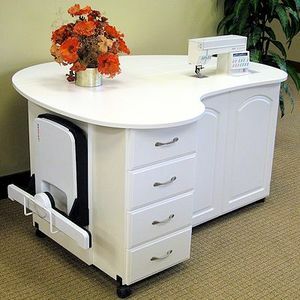 The large drawers and the Electric Lift make it a must for any Quilter using a sewing machine. Currently only available in White. Bi-fold doors get completely out of the way for getting down to business. The large leaf in the back folds down for flat storage against a wall. With our heavy duty Electric Lift the 8300, Quilter's Cloud 9, handles the larger sewing machines and their embroidery modules. * Some assembly is required. Due to the shape of the top, it ships in a separate box and requires placing on the top of the cabinet and locking the cams. The drawer pod ships retracted in the cabinet and requires extension as marked and 4 bolts affixed. The unit ships without the castors installed, so they must be put on. Opening for machine is 27" Wide by 14" Deep because of lip underneath to hold insert. Order Insert size 27" by 12 1/2"
Product specifications are subject to change without notice. Actual colors/tints may vary from those shown. Fabric, sewing/serging machines and miscellaneous items are for demonstration and not included with the unit unless specified. Rounded edges and no corners reduce drag on materials for a smooth work flow. The 4-drawer pod extends out to allow easy access to the drawers. Bi-fold doors for fewer obstructions. Our famous electric lift with optional Auto-Stop sets flatbed position for easy insert and extends warranty to five years. 27"x14" opening for larger sewing machines. Fold away leaf so the cabinet stores easily against a wall. Measures 59 1/4" wide by 49 1/2" deep leaf up (34" deep leaf down) by 30 1/2" tall. 27" x 14” opening for larger sewing machines. Fold away leaf extends work surface and stores easily against a wall. Surface has contoured edges for no snag no drag design. Interior hooks for embroidery hoops. Bi-fold doors for easy clearance. New Galaxy Line Oval door front available. “THE MOTHER OF THE NEW GALAXY LINE” With our heavy duty Electric Lift the 8300, Quilter's Cloud 9, handles the larger sewing machines and their embroidery modules. The exciting new 8300 sewing cabinet is a big hit! The large desk top with round curves and rounded edges allows fabrics to flow easily as you work. Our optional Module Rack mounts on the left side for Embroidery module storage. Optional embroidery module holders are available for Bernina and Janome machines among others. Every one I know that sews wants one of these cabinets. Beautiful and roomy. Love this cabinet! If there is a ledge below the top of the opening to support an insert without a lip on top, how deep is it? Standard is 1/4"
Do you have a knee lift that you will be using? Fashion Cabinets Epic Journey for Brother XP1 Luminaire Solaris, Electric Lift, 3 Position Auto Stop, Round Edge, Machine Opening 29x14" Insert 30x16"
Fashion Sewing Cabinets 812 Sewing Machine Display Table, White or Swiss Chocolate, 60"Wide x 19 1/4"Deep x 27"High, Top Shelf Adds 19" to Height 46"
Fashion Sewing Cabinets 5610 Sewing Cabinet Premium 4 Drawer Cabinet Opening 27" x 12.5"
Fashion Sewing Cabinets Model 4502 Eclipse II Q, Choose Manual or Electric Lift, Opening: 27" x 13.3"
Fashion Sewing Cabinets Cutting Craft Hobby Tables #97 60x32", or #98 72x40"
Sylvia 1000 Dual Machine Sewing Serger Cabinet, W84" x D20" x H29-3/4"
Sylvia 1050Q (810Q & 500) Dual Sewing Machine and Serger Cabinet 80x20"
Tailormade Q-Teak or Q-White Quilters Vision Sewing Cabinet 71x55x30"
Arrow 350 Norma Jean Sewing Machine Cabinet Oak 81x20"